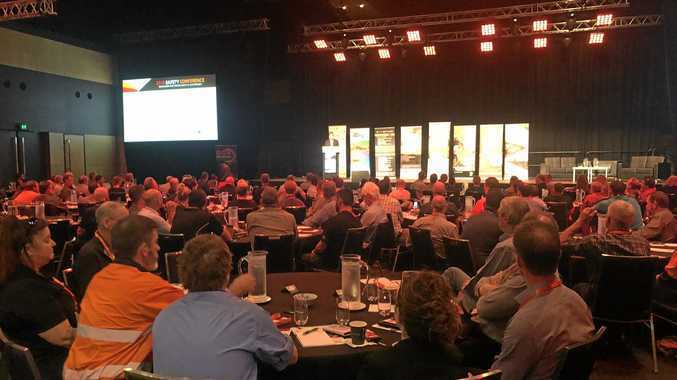 ALMOST half the 200 mining industry leaders at Resource Industry Network's Safety Conference this morning admitted to experiencing 'micro-sleeps' while driving. It was a stark and revealing reminder that fatigue can affect anyone doing shift work in the mining industry. Opening guest speaker Dawn Deakin, who lost her husband Trevor in a crash on the Peak Downs Hwy in 2004, prompted the audience to raise their hands if they believed they had fallen asleep while driving. Most of the delegates raised their hands. Ms Deakin also spoke about her own recent close encounter with fatigue on the road. She was crossing a bridge on Peak Downs Highway on her way to Moranbah when a ute coming in the opposite direction started to veer into her lane, she stopped on the bridge with nowhere to go. Luckily the driver of the ute realise he was drift and went back to the right side of the road just seconds from disaster. "I phoned my sister and she said 'get out of the car'. I told her 'I can't because I won't get back in it," she said. "I went to Nebo. Went to the toilets at Nebo and threw up." "It was the scariest thing." She said driving long distances was a decision that a lot of people made, without regard to fatigue. "People are getting in car with their kids going to Airlie... Townsville," she said. "Chuck a movie on the iPad in the back seat and say 'we are not stopping until we get there'. "What are we teaching our kids. We're teaching them what Trevor did." RIN safety committee chairman Mick Crowe opened the conference. The passionate safety advocate touched on the loss of Daniel Springer and the Vella brothers since the last conference. "We lost Daniel Springer. He left us (G&S Engineering) two weeks beforehand, but (his death) didn't affect us any less just because he was wearing a different uniform," he said. Mr Crowe opened the conference saying he want a conference where there was no tragic stories to tell. Fatigue, suicide prevention, coal mine dust lung disease and safety culture were key topics at this year's Safety Conference.